An appreciation for nature’s joyful, simple beauty coupled with a desire to interpret this emotional connection through art has been a lifelong inspiration for Debbie Milling. Born in Montreal, Debbie spent countless hours of her summers at McGregor Lake immersed in watercolours. 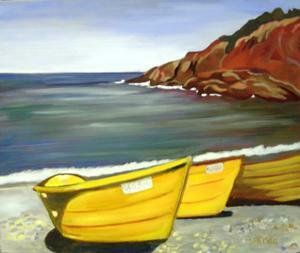 Currently, Milling’s fascination with waterfront scenes is being expressed in her oils. Extensive travel to Canada’s diverse regions offers Debbie the opportunity to capture views of remote Canadian landscapes. Her preferred mode of travel is by horseback or by boat; further enhancing her unique perspective. 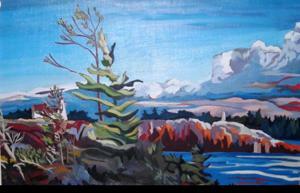 In addition to “open air” sketching in the field, inspiration comes from her studio, which overlooks the Rideau River. 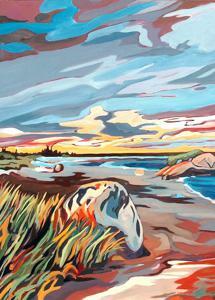 Debbie’s landscapes depict a scene rich in history and experience. This is a world untouched by modern technology. The buildings are weathered; in harmony with the landscape. There is a connectedness between each aspect of the view. The trees joyfully dance with the clouds. The water’s reflection of a red canoe on shore calls the canoe back to play some more. This collection of paintings celebrates the rejuvenating spirit of an outdoor adventure and an appreciation for nature as a source of happiness. Each painting speaks to the sensation when one exhales and smiles in a peaceful moment by the water. Debbie has participated in several group and solo shows, with her work gaining recognition and residing in private and public collections across Canada. 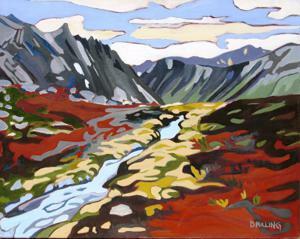 Debbie calls Ontario home and draws much of the inspiration for her work from the landscapes of that province. She has her horses in her field, her canoe at the ready, and her studio filled with work in progress.